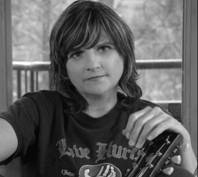 AMY RAY - Fall 2008 tour dates announced for her solo album, "Didn't It Feel Kinder"
New York, NY: Songwriter, icon and erstwhile Indigo Girl Amy Ray is set to tour the Midwest and East Coast in October /November 2008 for her critically lauded solo release, Didn’t It Feel Kinder. (Look for Amy to hit the West Coast in early 2008!) She’ll be joined by Brooklyn/Asheville NC folk-psych band Arizona for her Midwest dates and Brooklyn-based songwriter Jennifer O’Connor for her East Coast run. Ray’s core band will include former Butchies Melissa York on drums and Kaia Wilson on guitar. Her third solo release and her most ambitious to date, Didn’t It Feel Kinder finds Ray again trading in her acoustic guitar for a Les Paul, cranking her amp and reaffirming her position as one of the truest, most striking voices in contemporary music. For the first time in her solo career, Ray enlisted a producer. Greg Griffith (The Butchies, Le Tigre, Loudspeaker, Vitapup), a fearless listener and multi-talented musician, worked with Ray to incorporate a variety of sounds and influences to create her unique and evolving voice throughout this record. On the track “Bus Bus,” a song inspired backstage at a UK Indigo Girls’ gig as Ray listened to the bass and beats of the opening band throbbing through the club walls into her dressing room, she molds a danceable rhythm that is at once pop, punk rock and hip hop (aided by former Butchies and longtime Ray collaborators Kaia Wilson and Melissa York and Griffith). Additional guests include guitarist Tomi Martin, half of Three5Human (and who has played with the likes of Madonna and TLC) and songwriter Brandi Carlile, as well as indie faves Arizona. With 2001’s Stag and 2004’s Prom, Ray channeled her inner riot grrl and made two disarmingly personal, defiantly honest albums that tackled gender issues and sexual identity and established Ray’s punk rock cred and DIY ethos. It also proved Ray could rock with the best of them. While Didn’t It Feel Kinder is no less political or less catchy, Ray has written an album that reflects the rural nature of the recording process – late night drives between her home in rural Georgia and studios in Ashville, NC and time spent in Greensboro, NC. Lyrically, she tackles a culture obsessed by war, fame for the wrong reasons (“Who Sold the Gun," about the Virginia Tech killings), religious conservatism (“SLC Radio”) and makes a plea for the listener to reach outside of their comfort zone and connect with their community. Didn’t It Feel Kinder is a thoughtful, political album and a call to reason by an artist who’s intertwined activism and social consciousness into her music and remained fresh and relevant over a career spanning two decades. Ray has a knack for tapping into the universal human experience and bringing an empathy and call for understanding to even her most confrontational material.